Mix the first 8 ingredients. Make 4 patties and leave them in the fridge for 30 minutes. Braai the patties over moderate coals, or heat a little oil in a pan and fry the patties for 4 minutes on a side. 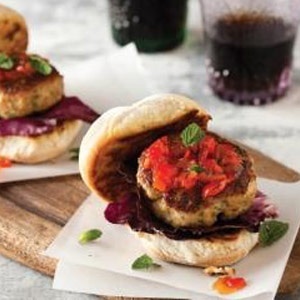 Fill bread rolls with a patty, some lettuce and a spoonful of chopped Peppadews to complete your chicken burgers.